2018 Shorty Award winner for best Creative & Media animal content ***Named one of the Best Comedy Books of 2017 by Splitsider*** "Over-the-top and hilarious." -Barkpost Based on the Twitter and Instagram sensation, #WeRateDogs features the most heroic, over-the-top adorable, wildly successful, all-around entertaining dogs the world has ever seen! It combines extraordinary photos with ridiculous captions to expand the knowledge and overall lives of its readers. It is not only an exceptionally reliable source for dog greatness, it is also a one stop shop for happiness. This book takes readers on a journey through the strict science of dog rating and the unwavering rules associated with it. Questioning the accuracy of these ratings is ill-advised. They are certainly not arbitrary and this book is absolutely not just about how cute dogs are. It truly is all about precision and ethics in dog rating. 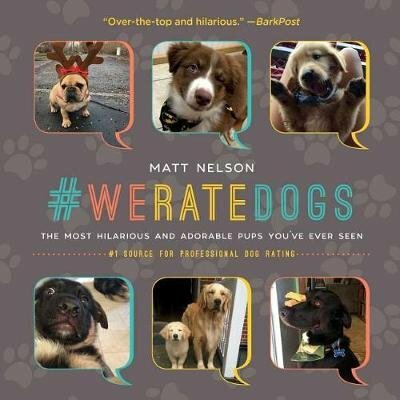 The #WeRateDogs book will produce an audible reaction with every flip of the page-whether a groan from a terrible pupper pun or an "aww" of seeing a super floofer. If #WeRateDogs takes you away from reality and pushes you into this conglomerate of absurdity for even a second, then it has fulfilled its purpose.